Measure and display the difference in grouping size and velocity consistency of various Nerf darts in order to discover a cheap alternative to Nerf Elite darts that allow for maximum performance. 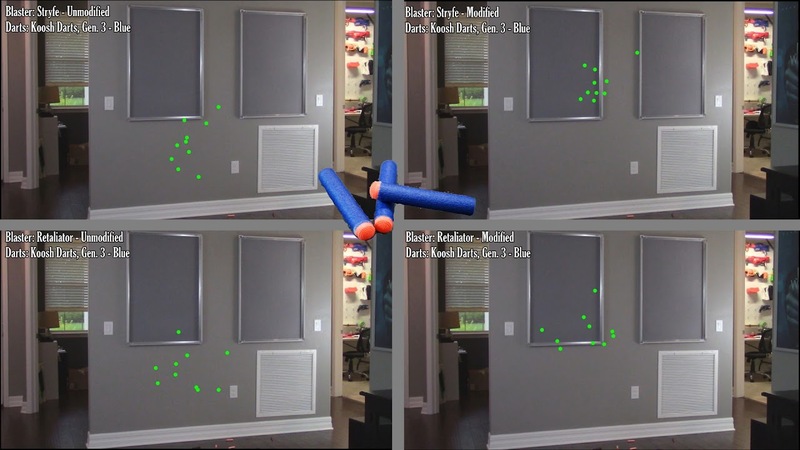 Grouping consistency refers to the grouping or collection of impact points that a particular dart can achieve while firing from a stationary blaster. A tighter, more predictable grouping leads to enhanced accuracy. A tighter group generally comes from a superior aerodynamic design that flies on a 'level' or 'straight' path through the air. Initial velocity consistency refers to the consistency in the velocity of a projectile immediately after leaving the barrel. Sure, we all want a super high velocity - but consistent, predictable velocities lead to a predictable dart trajectories, which allows the user to align and land shots from longer ranges. 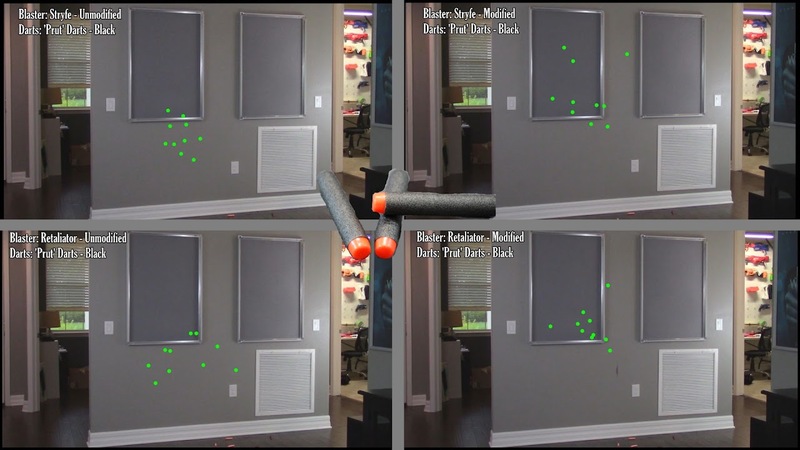 To test the groupings of different darts, I marked a firing location on my counter top to align the magazine of each blaster consistently for each dart test. This removes much of the 'human factor' when firing a blaster. This system allowed for each shot to be fired at the same elevation (parallel to ground) and point of aim. When looking at the groupings, don't worry as much about if the grouping is left, right, up, or down - that can all be adjusted with your point of aim later on. What we want is a very tight group of impact points, indicating a very consistent flight path. 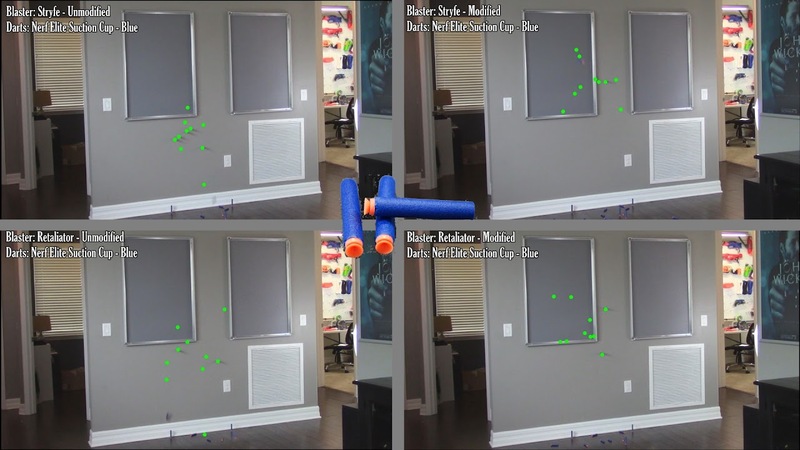 I filmed myself shooting a wall 10 times with four different blasters for each dart. 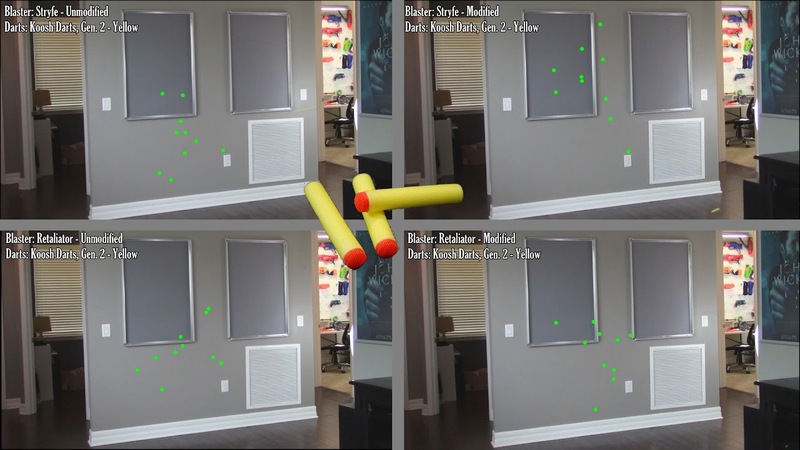 In an editing program, I added green dots indicating where each dart landed. This test took place from around 20-25' from the wall. Keep in mind, the different groupings will only being larger as you increase the range. For this test, I fired the darts through my chronograph, which is a device that measures velocity. I've used my chronograph many times in the past and am familiar with the small details that can lead to inconsistent results - and I avoided these. The #1 error with a chronograph is firing the blaster at a different distance from the device. Scooting just a foot or two back from the device can drop your velocities over 5-8fps because the darts immediately begin slowing down when they leave the barrel due to air resistance. The further from the muzzle, the lower the velocity. For my tests, I was consistent with the distance from the muzzle to the device. For both tests, I fired 10 brand new, never fired darts through each of the four blasters. That's 40 darts total, per dart tested. I used four blasters to get a range of the commonly used Nerf blasters. Some darts work very well with flywheel blasters but don't feed well through springers. 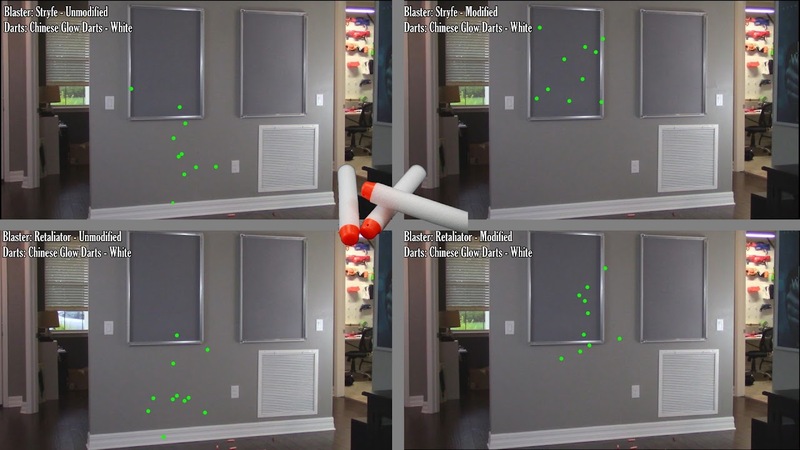 Some darts work well at lower velocities (<80fps) but become unstable when fired at higher velocities (>110fps). This range of blasters was used to sample spring vs. flywheel and low velocity vs. high velocity. Stock Retaliator: The blaster labelled 'Stock Retaliator' or 'Unmodified Retaliator' was not modified. The video shows the blaster without the barrel extension, but it was added for the test (because it was also used on the high velocity Retaliator). Modified Retaliator: The blaster labelled 'Modified Retaliator' or 'Upgraded Retaliator' was modified by adding an 5kg Orange Mod Works spring and removing the mechanical locks. This blaster has the air restrictor intact, and also featured the barrel extension because of the Worker pump action kit that was installed (the pump action kit does not affect the dart flight or velocity). Stock Stryfe: The blaster labelled 'Stock Stryfe' or 'Unmodified Stryfe' was not modified. It was running on four brand new AA alkaline batteries. I certainly didn't test all of the available darts on the market. I tested a few that I see used on a regular basis. The point of this experiment was mostly for my own knowledge about these darts, but also to show my viewers how I test my gear so you can test your own stuff at home. There will always be a new knock-off dart on the market and I don't intend to make a new video each time one comes out. The point is to show you how these tests can be setup to yield accurate, very helpful data. - The linked darts ship from China so the shipping is slow. - These were replaced by the gen. 3 Koosh darts. Gen. 2 darts are no longer sold. - I'm putting these in the comparison to explain why I whined about these darts in my Koosh dart retraction video. - Funny enough, these are also sold by the 'Prut' Amazon seller. Despite their images being similar, these are of a very different design than the 'Prut darts' in this experiment. - Prut dart is not their official name. It's just how I'm addressing them. - These darts have plastic tips that aren't hollow so they don't compress on impact. This makes them hurt people when shooting from highly modified blasters which has resulted in these darts (and the many similar designs available on eBay) being banned in many HvZ games that have safety regulations. I do not recommend these darts if you use modified blasters - there is a risk of injury that is simply not worth the cost savings. Don't be that guy that enjoys hurting their friends. Not cool, bruh. The values listed are the measurement of velocity in feet per second, or fps. Some of you may see all of this information and say, "so they're all pretty much the same, what's the big deal?" and you're technically right. They are all pretty similar on a grand enough scale. However, you can definitely see better groupings for impact points and more consistent velocities out of some darts. These tests were also done at ~20' of range - so these groupings will become more spread out and relevant when you're trying to pick that zambie off at 80'. These differences won't matter to many Nerfers and may not even be noticed by others. But many small improvements, all acting together, can give you a massive advantage of opponents that don't think about these details. Nerds rule the world for a reason, my friends - we analyze the details and take every advantage we can find through research and experimentation. My results and opinion on each dart do depend on what type of blaster you use (flywheel vs. springer and low velocity vs. high velocity) so I'm breaking down each dart with my opinion. Grouping - Terribad. These groups are why so many Nerfers are seeking an alternative! Velocity- Very consistent velocities, while also being regularly high velocities. Dart to dart consistency is great. Opinion - Meh, they do the job. Even with their consistent velocity, you really can't consistently hit anything beyond 30 feet, which is irritating. These aren't especially cheap, either - so I don't recommend you go out and buy EXTRA Nerf Elite darts. But since you probably have a stash from the 6-10 you get with each blaster, they're definitely worth using if the alternative is switching to a melee toy - haha. Grouping - Pretty tight. An occasional outlier flies loose, but the general group is tight with both flywheel and spring blasters. Velocity- Pretty good consistency with decent initial velocities. Very stable in both springers and flywheel blasters. Opinion - Great performing dart in both flywheelers and springers. These are a great option if the cost isn't an issue for you. Perhaps this option is viable for the indoor Nerfers that don't have douchebag, dart-theiving friends so you can achieve a high recovery rate. Grouping - Superb. These really excel with flywheel blasters but still perform quite well with springers. Velocity- Pretty consistent in flywheel blasters, but pretty sporadic in springers. Opinion - Great darts! If you use flywheels, these are hands-down the best option from this experiment. They are affordable and performance extremely well. Grouping - Terribad. Just as bad as Elite darts, which is saying a lot. Velocity- Many random duds which plop out of the barrel with terrible performance. Inconsistent dart assembly leads to these outliers. Opinion - I don't recommend you buy these at all. The performance is worse than normal Elite darts... lol. Grouping - Meh. Perhaps a bit tighter than normal Elite darts, but not by too much. Velocity - Averaged lower velocities with many outliers with the spring blaster. Not especially strong performance. Opinion - Given their cost, these darts aren't worth it. Grouping - Meh. The unmodified Stryfe and modified Retaliator had acceptable groups, but there were many outliers and overall not a fantastic grouping. Better than normal Elite darts, though! Velocity- Prett decent consistent with flywheel blasters but terrible with springers. Even on flywheels, the average velocities were on the low side. Opinion- I do not recommend anyone buy these if you shoot at humans. The plastic tips hurt and really aren't fun in high powered blasters. Also, the performance isn't even great, so I'm not sure why you'd pick these unless you just want to hurt people. If that's the case, get the ef out of our hobby, yuhh nerddddd!